LINCOLN, Neb. 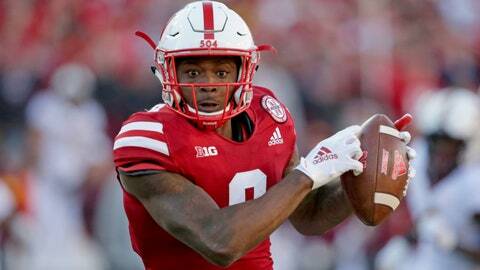 (AP) — The most productive four-game stretch of his career has put Stanley Morgan Jr. in position to leave Nebraska as the greatest receiver in program history. The senior has caught 32 passes for 463 yards and six touchdowns to help the Cornhuskers (3-7, 2-5 Big Ten) win three of their last four games after an 0-6 start. Morgan has 178 receptions for 2,599 yards in his career and needs just four more catches and 91 yards in the last two games to pass Kenny Bell as the Huskers’ all-time leader in both categories. Another 144 yards would make him the school’s first player with 1,000 receiving yards in a season. Morgan was targeted nine times in this past weekend’s 54-35 win over Illinois , and he caught eight. Two went for touchdowns. Of his 131 yards, 62 came after the catch, according to Pro Football Focus. Morgan has blossomed since the start of his junior year. The New Orleans native was prone to dropping passes his first two seasons, and in the spring of 2017 he was charged with marijuana possession in Florida. Prosecutors dropped the misdemeanor charge after he completed a treatment program. With three of the Huskers’ top four receivers gone from 2016, he nearly doubled his production and caught 61 passes for 986 yards and 10 touchdowns. He led the Big Ten with 89.6 yards per game and probably would have gone over 1,000 for the season if he hadn’t missed a game because of a neck injury. Morgan decided to take his chances with a new coaching staff and return for his senior season. He was named a team captain, a tribute to how far he’s come. Morgan, who goes into this week’s home game against Michigan State (6-4, 4-3) with 59 catches for 856 yards and seven touchdowns, is in line to be the fourth Nebraska receiver taken in an NFL draft since 2011. As for breaking the school records, Morgan has Bell’s full support. Bell, whose last season was in 2014, was on hand for the Illinois game, and he and Morgan chatted beforehand. Even if Morgan passes Bell, he knows his time at the top of the charts could be limited. Sophomore JD Spielman has caught 66 balls for 818 yards this season, and he’s the fastest player in program history to record 100 career catches. He’s only 951 yards behind Morgan in career yards with two years to play, unless he leaves school early.